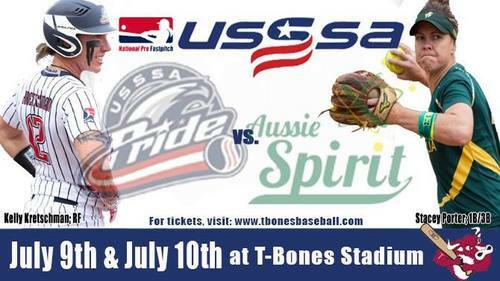 KANSAS CITY, Kan. – The Kansas City T-Bones and National Pro Fastpitch will host a two-game series between the USSSA Pride and Aussie Spirit July 9th and 10th at T-Bones Stadium. This is the fourth year in a row the T-Bones have hosted an NPF series after featuring the USSSA Pride and Texas Charge in 2017. The USSSA Pride team roster is led by two-time Olympian and reigning back-to-back-to-back NPF MVP Kelly Kretschman out of the University of Alabama. She is joined by Sierra Romero, the 2016 NCAA Player of the Year at the University of Michigan and the 2017 NPF homerun & RBI leader and Jessica Burroughs, the 1st overall draft pick by the Pride out of Florida State and the 2017 ACC pitcher of the year and First Team NFCA All-American. . The Aussie Spirit roster features Stacey Porter, Captain of the Australian National Team and a Olympic Bronze and Silver medal winner. The Australian team also includes Taylah Tsitsikronis, with two seasons of NPF experience with the Pennsylvania Rebellion and the Chicago Bandits and was the first Aussie Spirit player to sign for 2018. Rachel Lack, out of the University of Hawaii and veteran Aussie Spirit star also is part of the roster coming to Kansas City. “We’re thrilled to host these world class athletes and the top women’s pro players in the world at T-Bones Stadium this summer. Our stadium is the perfect venue for this series and we’re glad to bring this showcase event to Kansas City, KS and our metro area overall,” said T-Bones Vice President and General Manager Chris Browne. Following each game both teams will be available for autographs and to meet and greet fans in attendance at the ballpark. Gates will open at 6:00pm and first pitch is at 7:05pm for both nights. “We're unbelievably excited to welcome the Aussie Spirit to the midwest this summer and to T-Bones Stadium, especially. With an attendance record of over 15,000 during the Pride series last year, we can't wait to be able to give these incredibly talented Aussie athletes the stage to perform in front of an even bigger crowd this year,” added Jeremy McDowell, Executive Vice President USSSA. Tickets for both nights are available now at the T-Bones Stadium Box Office, by calling 913-328-5618 or at TBonesBaseball.com. Home opening night for Kansas City is May 22 when the T-Bones host Gary SouthShore at T-Bones Stadium at 7:05 pm. Season, group, mini-plans and nightly party suites are on sale now and can be purchased by visiting the Box Office at T-Bones Stadium. Call the Box Office at 913-328-5618 or purchase and print at www.tbonesbaseball.com. Box office hours are 10:00 am to 4:00 pm Monday – Friday and10:00 am to 2:00 pm Saturday. For additional information or interview requests, members of the media may contact the T-Bones Media Relations Department at (817) 739-3693. Stay tuned to www.tbonesbaseball.com and the T-Bones Facebook and Twitter pages for updates throughout the offseason.